On Second Scoop: Ice Cream Reviews: Don't forget to have fun! Wow, I haven't said that in forever. I really have forgotten to have fun with my food recently, but then I stumbled upon "Ice Cream Paradise" on the Travel Channel this afternoon. We only got to see half the episode, but that was more than enough to stir the craving for a fresh sundae. Behold! 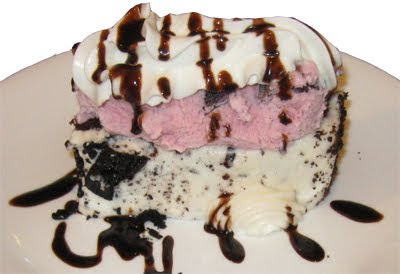 This is Black Cherry ice cream on top of a single layer Oreo cake (which is on it's side). It's topped with all natural Cabot whip cream and then drizzled with Nesquik in an attempt to make it look fancy. The black cherry and chocolate cake combo was quite good actually, though at the end I ran out of ice cream before I ran out of cake (I was in the mood for creamy, not cakey). Your turn: show everyone what you can do! Thinking of serving fruit filled Waffle cones as one course for Thanksgiving. The box shows a cone filled with fruit, but wonder if it won't get too soggy and messy. Anyone ever tried to use cones that way?? ?